I bought it just because I'm really excited on the replacement potential of AI. But its REALLY necessary to add arrows (at the ends of lines) and dash lines in my work as a UI designer. so Plz add this function into your product ASAP. I'm almost crazy and it really disturbs my work!! I try to import PDF with dash lines into AD from other apps, but it doesn't recognize dash lines at all???? ?Whats this problem??? I looked around the bbs and found lots people who have the same needs. NOT only use the arrow tools!!!!! its really not easy to use!!!! Go to the Customer Beta section of the forum here. Since you bought a copy from the MAS, you can use this beta and install it side-by-side with the MAS version. I'm not sure which update added the arrow shape tool, but both AD & AP 1.4.1 have one. 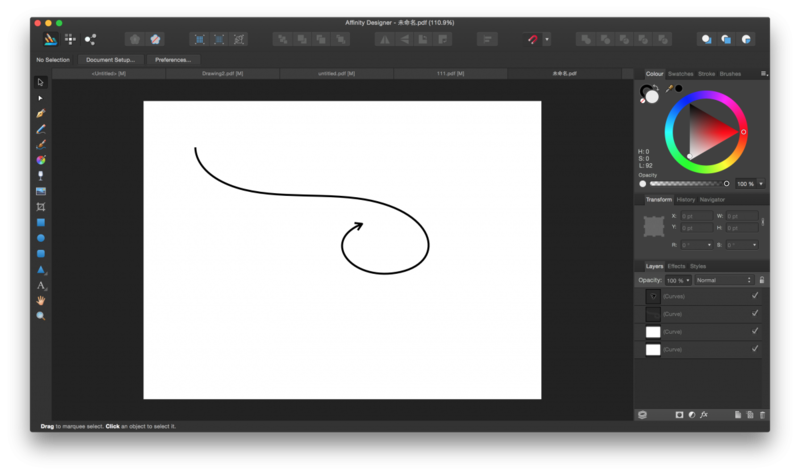 The tool isn't like that found in most other graphic apps -- instead of adding arrowheads to strokes, it creates arrow shapes (curves). On the upside there are lots of variations possible (see attached); on the downside the arrows can't be curved like with stroke based arrows. Dashed strokes are also available in the 1.4.1 versions. Yes, he and we knew that. 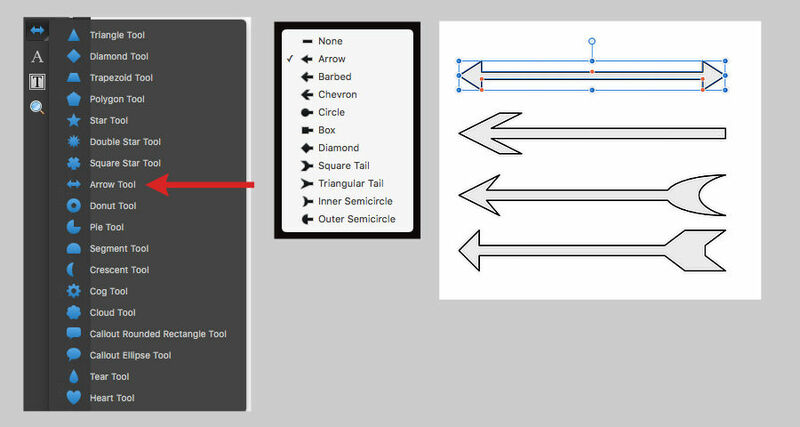 But for about 1.5 years zing0714 and “lots people” need “arrows at the ends of lines … NOT only … the arrow tools!!!! !” as you can see in his attached screenshots. Apologies. I did not explain what I meant very well, which was just that I assume arrows are no longer on the roadmap because they added the arrow shape tool, which I'm guessing they think is enough. But like a lot of other people I do not think that is enough & would also like to see arrowheads as an option for the end(s) of strokes, at the least for open curves. Having the shape options shown in the center box of my example would be nice, but for now I would settle for some simple arrowheads that for example scaled with stroke weight. Ronnie made some arrow brushes. Maybe they can be of help? I've updated the Designer road map to include arrow heads. I've no idea when they will be done, but it will be in a free update before 2.0. That's the best I can say at this time. I suspect even an army of developers could never add everything users request. There will always be "one more thing" that some will feel is an essential missing feature ... & several different, often mutually conflicting ideas about how it should be implemented. However it all plays out, I hope the developers can avoid the bloat that some apps have acquired over the years that require ever more powerful hardware to run even relatively simple operations at reasonable speeds. We only were astonished that nobody answered zing0714 for such a long time, not that it was not implemented. A simple “Arrowheads are on our C F R I” (where it still is) some weeks later would have been great. Thanks! :wub: BTW: Matt started about three months ago with them? Don't know if anyone has time to put together a timeline of past improvements, but I know if would be good for me to review them when I get impatient with the thing I'm still waiting for (for me the biggie is offset/contour) It's easy to forget that SO much has been added in a rather short time, and all free updates!! I need arrowheads on paths, one end, both, and arrowhead shape options.